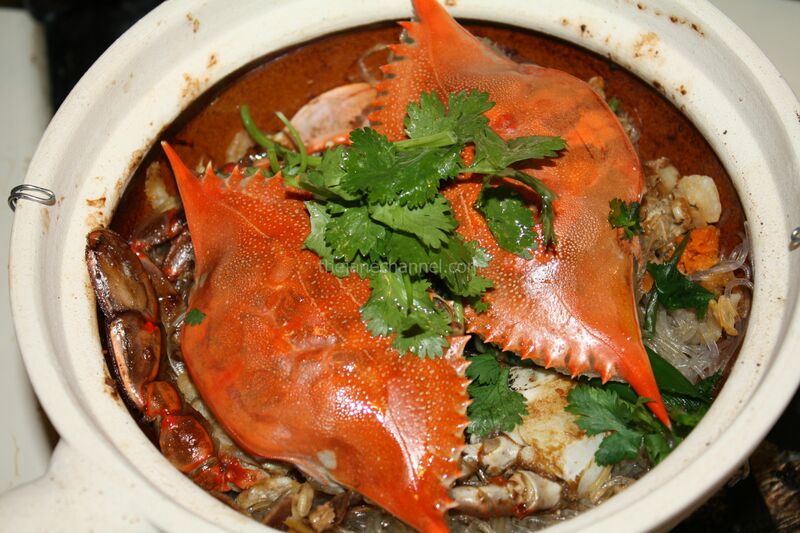 In western cuisine, it is not common to see whole crabs served on the dining table. To a certain extent, this is understandable. Getting meat off the crab is a lot of work for the diners, and often a messy affair. However, it does have it merits, which helps explain why it is so popular in many Asian cuisines. Most people who have tried whole crabs would tell you that being “hands on” is actually a lot of fun, and makes the food seem tastier! 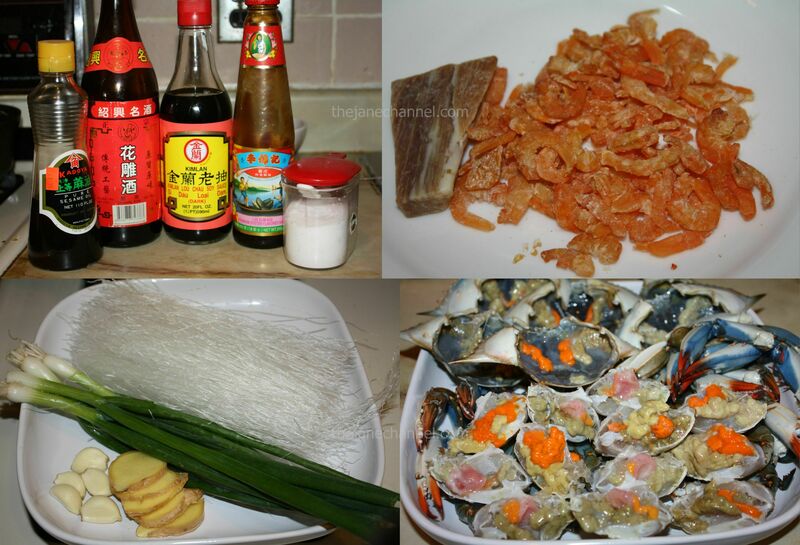 Remove crab shell and discard crab guts. Clean with brush carefully and rinse well. Chop into 4 pieces. Soak vermicelli in warm water for 30 minutes. Drain and set aside. Prepare dried shrimp stock: Bring a pot of water to boil over high heat. Add dried shrimp and ham. When it boils again, reduce heat to medium-low and simmer for 40 minutes. *If you have a can of chicken stock, you can omit this step. Heat oil in a skillet over high heat. Lightly coat the crabs with corn starch and pan fry in skillet. Remove from skillet when they are halfway cooked (about 6 minutes) and set aside. Heat oil in a skillet over high heat. Stir in garlics, gingers and scallions, until fragrant. Add crabs, cooking wine, oyster sauce, sugar and soy sauce, stir fry for 5 minutes. Transfer dried shrimp stock to a claypot and add in vermicelli. Cook for 5 minutes. Add the cooked crabs on top of the vermicelli. 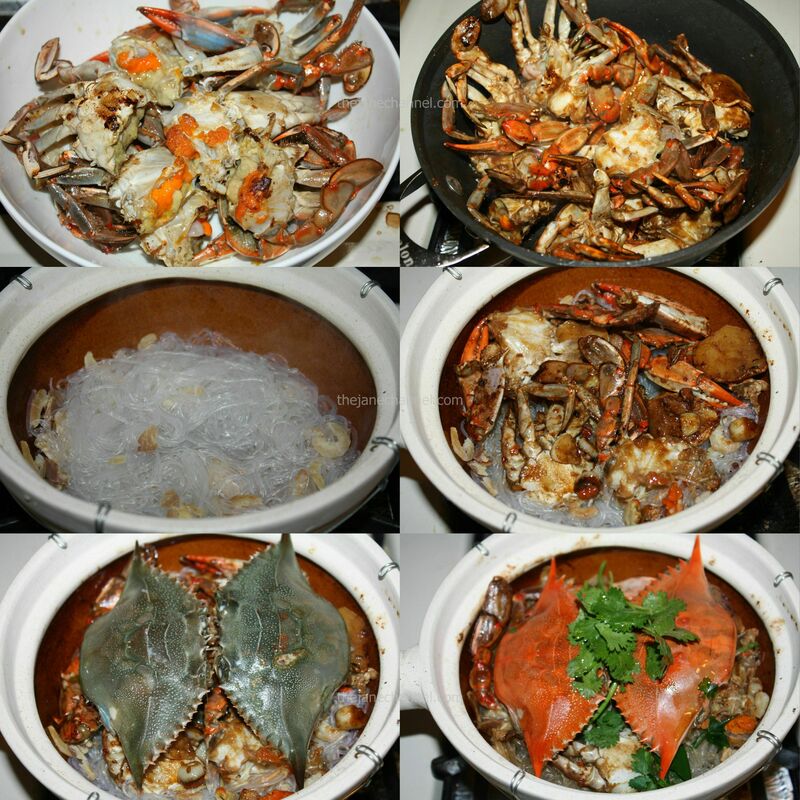 Place two crab shells on top and cook for 10 minutes or until the shells turn red (indicating the crabs are cooked through) **This recipe makes 3 claypots with 2 crabs in each pot. Sprinkle cilantro and sesame oil to serve!